In today’s article, I will expose some more research related to uberNodes and their associated manipulators. After taking some years to explore different node design, data-flow and rig architecture , i manage to combine most of the rig evaluation into one unit. No matter how compact the node was its data was relying of a set of complex elements ( local transform attributes, matrix, settings etc). Those element were as well part of a complex hierarchy in order to expose animatable controls which can be manipulated by users. The answer in this case was to isolate elements relative to manipulation. So from this point my plan was to define my own virtual hierarchy. This hierarchy was replaced by a set of matrix array attributes. Interaction is then delegated to a custom manipulator. For debugging purposes all manipulators can be drawn on screen. Along the years we have seen different trend in the animation industry. For my project i wanted interaction to be done with a dedicated picker. The key point here is the hierarchy stay the same structurally ( simple FK for biped) but the manipulator can edit it freely with its own rules. Similar exploration were done in the past with puppetshop , CAT ( integrated later in 3dsmax) ,motionbuilder’s FBCharacter constraint and tool and even with ( gasp! ) 3dsmax decade old biped. 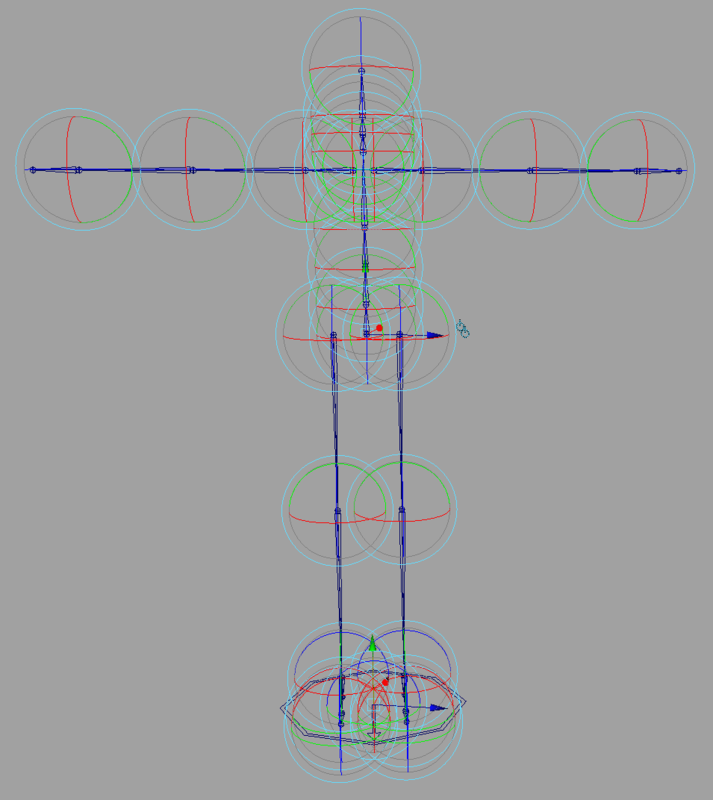 As an added bonus this node can build and draw a shape to evaluate the hierarchy pose and silhouette. (Above: cycling through hierarchy component and rootspace can be done through regular toggleManip added to the manipContainer, it was the debugging method until the picker was functional). As a regular maya component your manipulator will follow your animation and support undo, it will remove the needs of space-switching ,ik solver blending and any cycle which can appear when beginner tries to implement complex behaviour. Today I will show some re-factoring done on my old toggle node . This node purpose was to simplify a graph network by enabling user to toggle the state of a large number of elements. On the updated code the node will resize the output attribute array with and array data builder and then write the correct value from the selected currentActiveIndexValue. To help people have the least amount of preparation the primary mode of this tool will be focused on driving a parent constraint . The download section will be updated accordingly and expose how module installation works. Expanding on my previous post “Hacking maya annotationShape Node” this node was simply formatting text with a simple numeric input attribute. Coding wise that was pretty rudimentary project but fulfilled its mission properly. While using the factory annotionShape locator, I notice line break and tabulation were not supported. Hence me writing a custom node to fill this needs. The most interesting part of the node will convert the node position into screen coordinates. Inside a locator we can access directly the incoming M3Dview instance provided to us. So the code above will extract the 3d world position and use worldToView method to return screen coordinates. after that a simple list comprehension will consider each text line as a separate draw call and offset by 20 pixels on Y direction. Its the MFrameContext which will provide additional information like matrix data. and simple tool will follows soon. For now a sample file can be studied inside Mayanomicon/sample/reportSample01.ma. Let me know if you have questions and as usual have fun hacking maya.